Sovereign Concert-size Guitar ca. 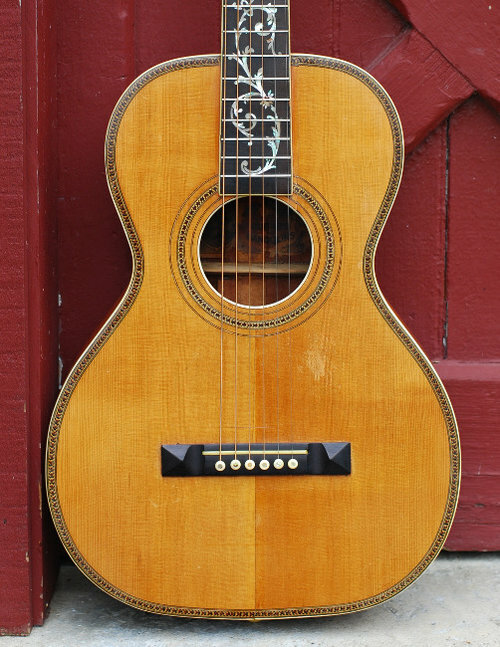 1920 | SOLD | From the Stefan Grossman Collection, an early and high-end Oscar Schmidt made acoustic guitar. The Schmidt company reserved the Sovereign name for its top-of-the-line instruments. This example has all the hallmarks of those instruments including select mahogany back and sides, mahogany neck, spruce top, fancy marquetry trim on the top and back, and a abalone tree-of-life fingerboard inlay. The body measures 13 1/8" across at the lower bout. 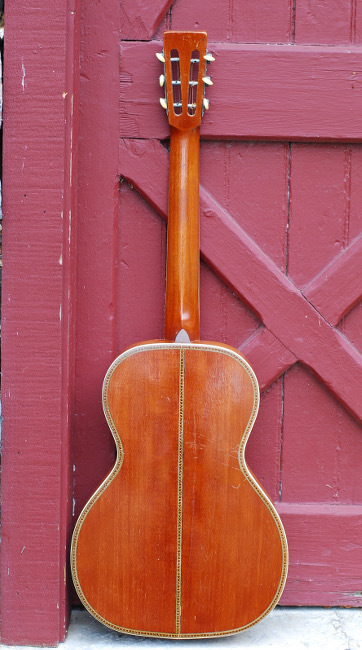 Scale length is 24 13/16", with the neck carved to a modern 'C' shape. 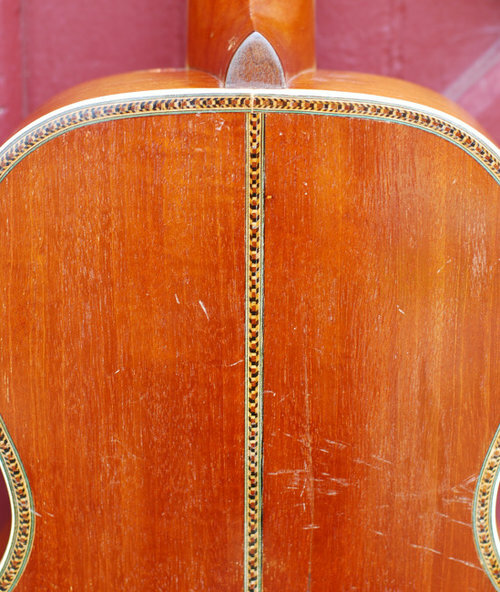 The neck measures 1 3/4" across at the nut and string spacing is 2 1/4" across at the saddle. Action is set at 6/64". Prior repairs include a neck set, crack repair on back, and it appears several back braces were reglued and/or replaced. The front of the guitar appears to have been over sprayed. There remains a hole in the heel from a strap button, and an open crack next to the fingerboard, treble side. Bridge appears original, and the tuners and bridge pins are replacements. Because of its short scale and nicely carved neck, the guitar plays very easily. The quality materials used in the body allow the guitar to resonate quite well, rounded and warm, with each note achieving separation from the next, almost an X-braced tone. We've owned a few of these high-end 'Stellas', and this is the sound we've come to expect. A wonderful little guitar for country blues or old-time music. Comes with a hard case.